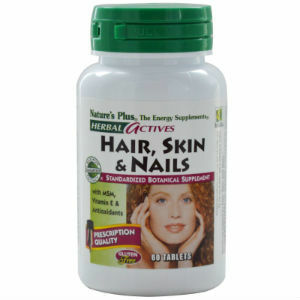 Below is a review of Nature’s Plus Herbal Actives Hair, Skin & Nails Tablets. The manufacturer of this product claims that it is aimed at giving structure, support, elasticity and strength to hair, skin and nails. Continue reading to find out more about the ingredients of this product as well as our opinion about its efficacy. Other ingredients include Microcrystalline Cellulose, Vegetable Cellulose, Steric Acid, Magnesium Stearate, Silica, Hydroxypropyl Methylcellulose, Di-calcium Phosphate and Pharmaceutical Glaze. It is advised to take two tablets of this product once a day, or as prescribed by your doctor. There are no known side effects of this product as it is made up of completely natural herbal ingredients and is considered safe for long term use. However, pregnant and lactating women along with anyone taking medication for a medical condition should consult their health practitioner before taking this product. In case of an allergic reaction to any of the ingredients in the product you need to discontinue use and seek medical attention. The price of one bottle of this product containing 60 tablets is not listed on the website of the company. However it is available on Amazon at $14.02. The manufacturer of this product has not given any kind of return, exchange or money back guarantee. So, if you are not satisfied with the results of the product then you have no way of returning it or getting your money back. There also zero reviews of this product on the company’s website which makes it a questionable purchase as you have no way of knowing about the credibility and effectiveness of this product. Herbal Actives Hair, Skin & Nails tablets is an herbal supplement that has been designed to provide strength, structure, elasticity and structure to the hair, nails and skin. It is made up of completely natural herbal supplements that are recognized all over the world in their potent forms. The manufacturer claims that it is the most advanced herbal supplement for internal beautifying. It is also fit for consumption of vegetarians and vegans. However, the manufacturer has not provided any kind of return, exchange or money back guarantee and the fact that this product has no reviews on the website of the company makes it a questionable purchase as you have no way to know for sure if it will work and if it doesn’t show the results that you desire then you can’t even return it. So, the bottom line is that this may not be the best product for you. John Brownstone	reviewed Nature’s Plus Herbal Actives Hair, Skin & Nails	on November 20th	 and gave it a rating of 2.5.